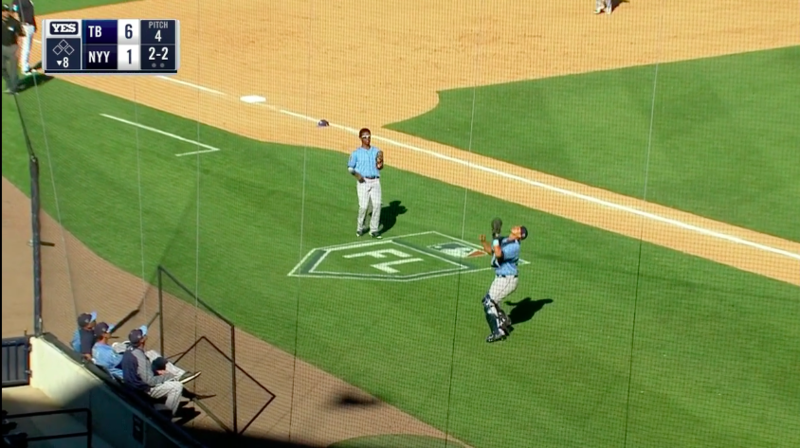 We tire of spring training pretty quickly, but I think it’s because we’re watching it wrong. We burden it with too many expectations, chief among them that it will look and feel like real baseball. Of course, it isn’t really baseball yet — John Andreoli is there — but the contrast of its not-baseballness to the baseballness of the regular season is illuminating. It teaches us things. The eighth inning is a particularly good time for such lessons. It’s such a funky inning! It’s good for people watching, too, because most of the folks we know have hit the showers. The almost-baseball gets weird, and the faces become unfamiliar. With that in mind, I watched the eighth inning of the available broadcasts for Sunday, March 4. Here are some of the people I met, the baseball I saw, and the things I learned. I’m not especially fond of jerseys with no names on them. 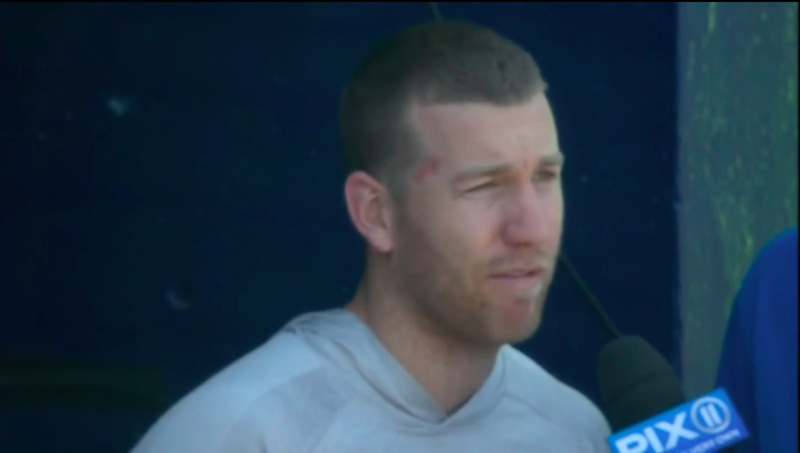 I get it: there are lots of dudes running around spring training. Prospects and non-roster invitees, big names and big numbers. The “who” of a guy can get lost in all that shuffling between big-league camp and the back fields. There is an elegance to the nameless jersey, a sort of brutal honesty. It says, “You can probably look away now. Go grab a hotdog.” You know, how a jersey talks? It signals to the crowd that we can try to beat traffic. But it feels so impersonal, and it would cost so little to give every player the dignity of his name. It’d give moms and grandmas so much more to go on at Thanksgiving. “Here’s my boy.” Nameless jerseys are awful in a medium way most of the time, but occasionally they’re a kindness. Brian Mundell won’t talk about this moment at Thanksgiving. Despite all his hard work and years of practice, he fell down. We might be inspired to say, “Aw, buddy,” and gift him a little sympathetic frown, but we aren’t quite sure who we’re looking at. The anonymity of his jersey protects him. 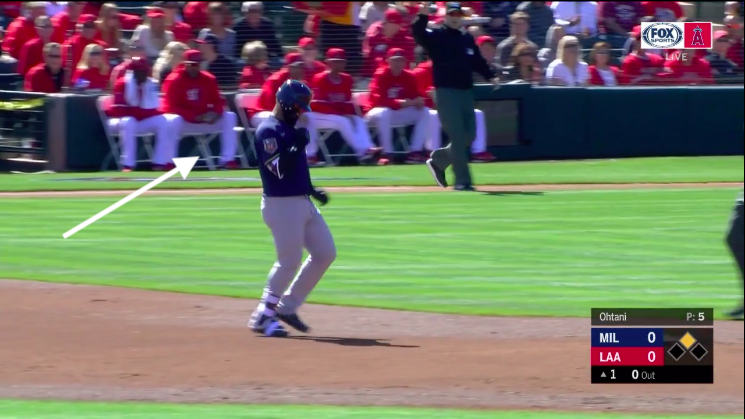 Nolan Arenado probably won’t ask him about it. He won’t become a Twitter joke, the fringe prospect who fell down. When he’s getting gas in Scottsdale, a kid buying gum won’t smirk. He’ll get to move on from this small bit of failure until he doesn’t remember it anymore, in part because it was a minor moment in spring, and in part because he’s 77. And who’s 77? Just some nameless guy. Could be anyone, really. We always think about the eighth being the place for young guys, the no-names, the numbers-onlys, but it is also the place for veterans trying to extend their careers. On this particular day in the world, it was also home to Ruben Tejada, making a nice play. “Tejada’s played some solid defense… probably the frontrunner right now for the utility spot.” Tejada’s best year as a pro came in 2011, when he was worth 1.8 WAR for the Mets. He played 41 games for the Orioles last year, good for a 56 wRC+ and -0.2 WAR. He was a non-roster invitee. Presumably they know what they have in him. On some level, this a bit of show. But we like a little razzle dazzle in players’ second acts. It’s what keeps the curtain open. Spring training is baseball, but only kinda. Whatever else baseball normally is, one of the goals is to win. We might say it is the goal. In spring, though, it’s like the sixth goal. Maybe the 10th. There is a case to be made it is actually the 20th goal. Winning gives way to tinkering, to improving, to stretching, to making the team. Sometimes fans have goals. In a Phillies game that same day, a little boy reached out and grabbed Phinley’s fin, a moment that reminds us that just about any dumb thing can make kids happy. Lucky kids. Because of all these different goals, most of which aren’t winning, you get funny, kinda baseball things, but not all-the-way baseball things. Like an at-bat being about “working on something,” rather than getting a hit or drawing a walk. And because it is only kinda baseball, we let fans off the hook. We’re less haughty about people paying attention, or even facing forward. We let, especially in the late innings, the ballpark become like a living room. These folks aren’t watching the game anymore. Maybe they’re talking about what colleges their kids are considering, or road construction near home, or the Orioles fifth starter, or that time Judy just killed Bill at bridge. (“Yes, I did, Bill.”) The game fades into the background, providing occasional texture to their chat with the pop! of a glove or the crack! of a bat and they carry on, Bill and Judy and their neighbor, just as they might some June night back in Baltimore as they get dinner ready and fret about life away from Camden Yards. It is then, in late innings, as the shadows start to creep and tinkering gives way to just making the team, that this kinda baseball oddly finds its greatest kinship with actual baseball. After all, it doesn’t feel that different from home. … that Reymin Guduan, being a kind person who felt for Adolis and Andrew, decided to stumble himself. Once we socialize embarrassment, it tends to lose its bite. I mean, if we’re all wearing funny hats, it isn’t silly; it’s a trend. 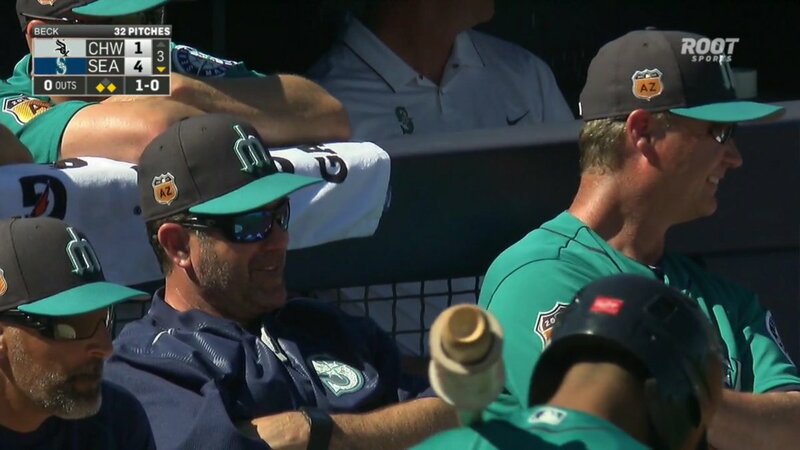 One of the funnier parts of spring-training broadcasts is how much present-baseball time they spend talking to people about future-baseball time. They talk to managers and coaches and GMs, but no one is a more intriguing get than the newly signed free agent. That’s understandable. He hasn’t been there that long. It took me months to tell two of the sales guys at my first job apart, mostly because they both wore very tight, very similar tailored suits. It was sort of like a uniform. They also said, “Yeah baby!” a lot. They weren’t so dissimilar from ballplayers in some ways. But back to Todd. He’s telling us — very quickly– that one of the players he does know is Amed Rosario. I suppose a third thing you should know is that Todd’s mouth is about to get ahead of his brain. It’s about to take him to a place he wasn’t expecting and make him feel silly. We go live to the betrayal. BRAIN: So far, so good. Normal talking stuff. BRAIN: Definitely ranks. Sure talking pretty quickly there, Todd. Might want to slow down. 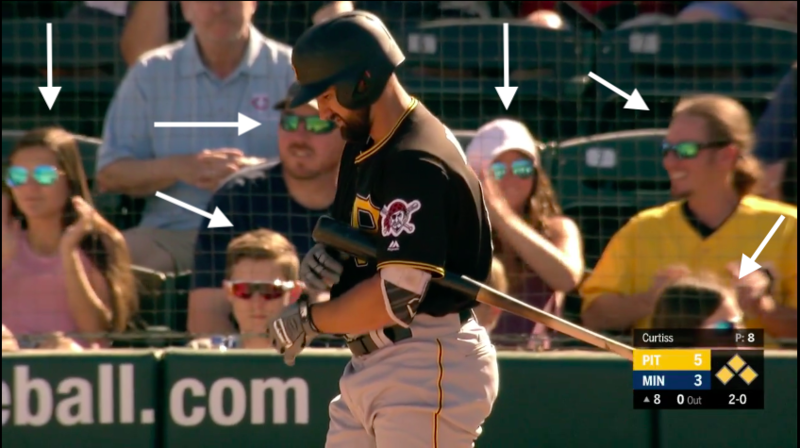 We meet a family who, not satisfied with the obvious matching of wearing Pirates gear, took advantage of what we can only assume was a gas-station sale on shiny sunglasses. We also learn that the younger brother is in that phase through which teenage boys sometimes go where the entirety of their personhood, just all of their being, can be expressed by doing things slightly differently than how the rest of their family does them. You just don’t get it, Mom. 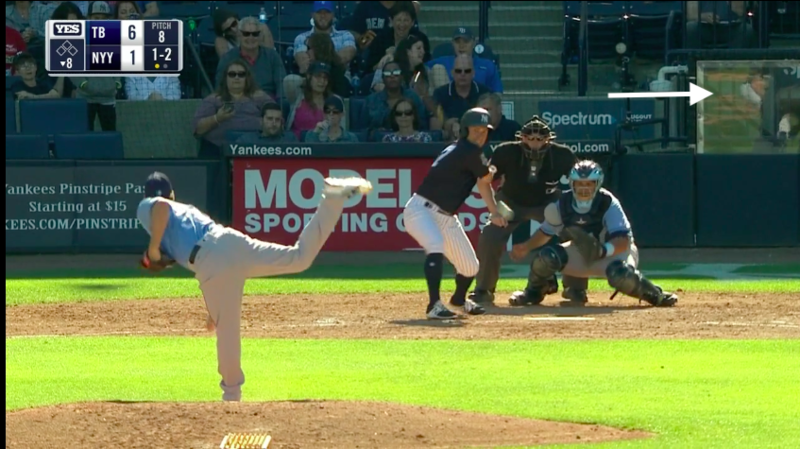 First, very quickly, and I hope you’ll excuse a brief moment of prurience, but once you notice that the players’ butts are reflected in the plexiglass behind home, you can’t unnotice it. Ump butts, too. They take on a funhouse mirror quality, distorted slightly and squiggly, and you realize you’re staring not at the pitch being delivered or at the batter’s swing, but at these funny bottoms. Having addressed the butts, I hope you’ll forgive a further indulgence and allow me to applaud the Rays coaching staff for engaging in good workplace safety by sitting behind a screen when they watch the game from foul territory. One of you guys is going to get bonked in the head, you goofs. Anyway, when we were little, my sister would insist that she was just as good at things as I was, but she wasn’t. It wasn’t her fault. I am two-and-half years older than her. I was a little taller and could reach things on higher-up shelves than she could and read chapter books and do fractions. These differences level themselves as you age; we both drive now. But she insisted — because she has self-respect and wanted to be taken seriously and also wanted to stay up until 9 pm. Spring training observes a similar relationship to the regular season. It tries to make you think it doesn’t care; it plays it cool, like all younger siblings do, but it gives us glimpses of what it really thinks of itself. 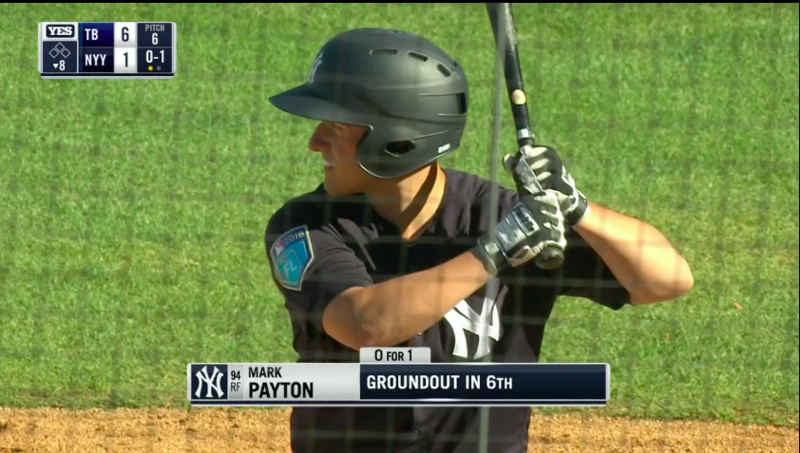 For instance, during this Yankees broadcast, the booth insisted, “This could very well be Toronto, Opening Day.” But they did so as Mark Payton prepared to swing. Mark Payton isn’t going to be in Toronto on Opening Day. Come on, now. 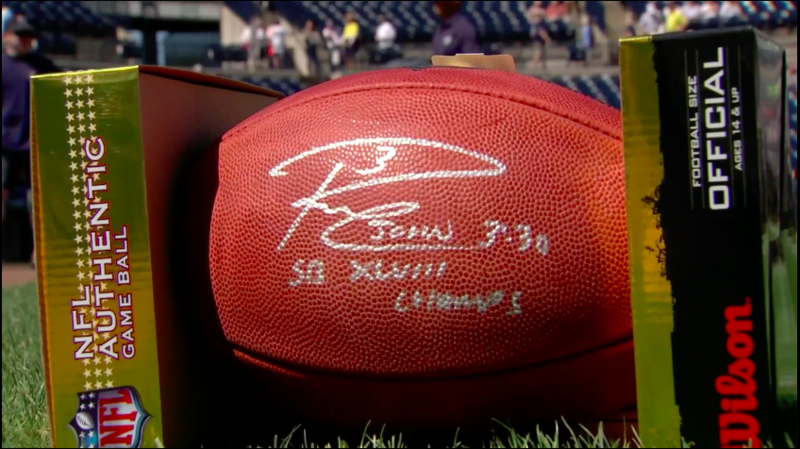 Earlier in the telecast, we were treated to an in-game feature about Russell Wilson’s time in Yankees camp, a story that ends with the revelation that the erstwhile Seahawks quarterback left each player with an autographed football. Wilson took his cuts and a lot of pictures, but his presence was a tacit admission that no serious baseball was happening. 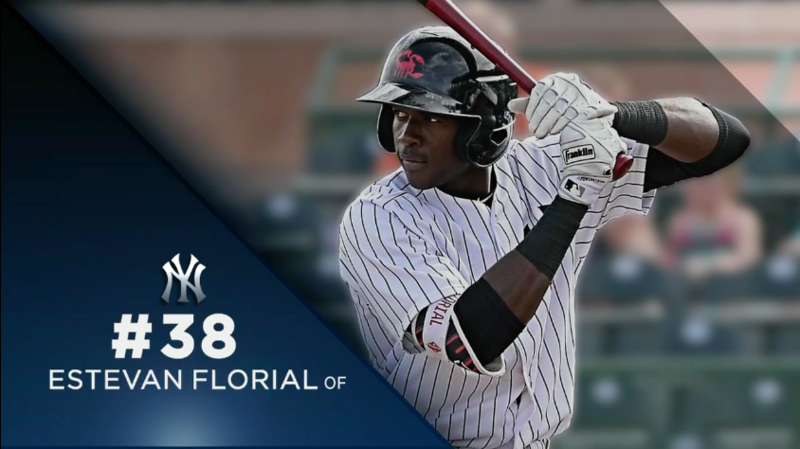 Later, as Estevan Florial batted, the broadcast shuffled through all of the Yankees prospects ranked in Baseball America’s Top 100. “That’s some big league graphics for spring training. Show those pictures, ready to go. All numbered. [Truck’s ready.] Ready to go, just champing at the bit.” They stopped short of saying whether or not the photoshop guy was in the best shape of his life. And look, they’re nice enough graphics (though each prospect receiving his own might suggest the broadcast was eager to fill time), but there’s nothing so remarkable about being able to properly label six pictures and use them in a segment. That’s standard TV stuff. But it isn’t so surprising: when my sister first started finishing chapter books, she’d run into the room and tell me about it. It was adorable, and learning to read is, if you think about it, a remarkable accomplishment. But she made the mistake all younger siblings make when they’re trying to show up their older siblings. She forgot to act like she’d been there before. We expect too much of spring training. I understand why: it’s become a popular vacation, and we always expect too much of our vacations. We want it to fill the void the months of no-baseball have left, and we think we’ll like this almost-baseball. Unfortunately, it just leaves us hungry for the real thing, with faces we know and goals that are familiar and fewer strangers napping on the outfield berm. We get agitated, having spent money and days off from work to be there — or languishing at home, not getting a tan. But perhaps we ought to appreciate it for what it is. It provides some unexpected moments. You can meet all sorts of folks and learn all sorts of things if you really want to. Especially in the eighth inning. We hoped you liked reading The Things You See in the Eighth Inning of a Spring Game by Meg Rowley! This article is everything that I don’t come to Fangraphs for. Could not disagree more. This is what makes FanGraphs FanGraphs. Great stuff, Meg. It must be terrible to be forced to read an illustratively titled article at a website that you don’t pay for. Your wRC+ is sub Jeff Mathis. Wow – so the moral of the story is criticism in any form will not be tolerated or the gatekeepers will curb stomp you. I love Fangraphs and read it religiously daily because I love how they break the game down like no where else on the web. This post to me belongs on Cut4. Stop acting like I’m trying to burn the place down. You seem to have issues with hyperbole. No, my gentle ribbing of you was not curb-stomping. I would suggest trying constructive criticism in the future rather than your original post. Does that seem fair? Although it looks as though the majority of the voters disagree with me, I don’t think my original comment was out of line. There was no personal attack on the author, no profanities, or vitriol of any kind. I stated that this isn’t the type of article I’ve come to expect from Fangraphs. The comment section is open for feedback and I left my feedback. Do you really not see the difference between the two statements? 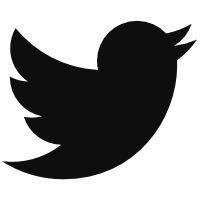 If you want to better understand the feedback, Google the term “echo chamber”. Once again, someone doesn’t understand the concept of not reading articles that don’t interest them. So what if I read it based on the thought that it would be similar to most every other article Fangraphs posts by having a breakdown of the game and was disappointed at the end that it was just an article of the author poking fun at people in the stands and players falling down. Yes, Meg should add some analysis to her posts making fun of players falling down the way Jeff does. There was a breakdown of the game. Multiple games, in fact. 8th innings, specifically. Shame on you for voicing your opinion. That is NOT what the comments section is for!! Finally some down votes! I just knew they would find me. This comment is everything that I don’t come to Fangraphs for. Are you sure? Commenters seem to get a great deal of engagement and enjoyment from comments such as this. Engagement doesn’t mean enjoyment. But you’re in good company, Facebook makes your mistake too.